When Autumn leaves, leaves are are here to stay…so lets use them. Leaves are a fantastic resource, it takes a little time but one the ball starts rolling they are a great material to use on the border. With this woodland garden we have made an area for containment basically four post and chicken wire. This year we have constructed a second containment. This Spring we hope the leaves from first containment will have broken down enough, this process can take two years so once a system is in motion on leaf mulch is available year after year. Once you have mulched the borders with leaf mulch this improves moisture holding ability keep weeds at bay(be generous 3-4inches depth if possible) and a nice meal for the worms as we do like worm poo I call that gold dust! 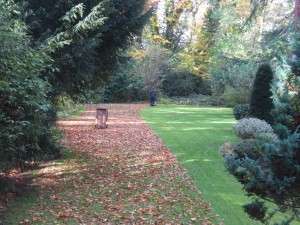 Leaves are broken down by fungi and is slower than normal soft garden waste as long as pile has access to moisture. Even if left on borders worms will pull leaves down and poo up the waste which is very fertile organic material. Though now you will understand worm casts on the lawn!! I have also used fresh autumn leaves to mulch container plants for the winter and you never know a little relationship of fungi and your plants may occur, this is all beneficial. This will be another blog to write.